Chapter 15 of the Gospel of Luke consists of three Parables: The parable of the Lost Sheep, the lost Coin and the lost Son. The “moral” of these stories is that God rejoices when sinners repent. All of Heaven rejoices! God’s mercy for sinners goes beyond our ability to understand. Many people would say “how dumb to leave a whole flock of sheep to go after one; what a waste of time and energy for a woman to search her house for one measly coin. Gee what a gullible Father to take back such a useless son—and throw him a party!! The younger son wasted his inheritance and turned his back on God and his people to live with pagans!! He spent all of the father’s hard earned money on wine, woman, and gambling. Certainly most parents today would take such a son back—but throw him a huge party. Are you kidding? Did you catch the most amazing verse in the parable of the lost son? “While he was still a long way off, his father caught sight of him, and he was filled with compassion. The father ran to his son and he embraced and kissed him.” Wow. The father was watching for his son’s return. Now that would be very unusual for a Jewish Father in this situation. The son had demanded his inheritance while his father was alive. This son had freely decided to break his relationship with his father—with his family. Even worse he freely decided to break God’s law. He chose to exile himself. When he had squandered his inheritance he took a job tending pigs. This was against God’s ordinances. It made him unclean—outside the law. He was a big time sinner. This young man had broken the Covenant with God. He had severed his relationship with God and with his earthly father. A Jewish father would have not have been looking for his son’s return. The son, by choosing to go against God, had cut himself off permanently from his father and his family. This son was dead to his family. Yet this Father was watching for his return. When he saw him way out in the distance, the father ran to meet his son—not a very dignified thing for a Jewish Patriarch of that time to do. It was such an unbelievable thing to do that the elder son couldn’t believe it, and he refused to acknowledge the lost son as his brother. He refuses to call him brother despite his father’s pleading. He calls him (to his father) Your Son. Not my brother. Of course, the Father in the parable is God. He wants us to repent—turn back from sin—to go through a conversion of heart. He is watching for us to return to God’s family. When we do there is great rejoicing in heaven. God wants us to turn away from sin and enter into a new life with him. A life lived in the trinity of God the Father, Son, and Holy Spirit. That is where our joy is. God loves us. His love and mercy are incomprehensible. We can only understand the agape love (agape is the word used in the NT) that God has for us through the Cross. Agape love is a complete emptying of self, of giving to other, of sacrifice. It is the kind of love that Jesus taught us by dying on the cross to save us from our sins. Conversion to a new life is the pre-requisite for finding joy in a new life in Christ. The father in the parable gives his son a beautiful robe, a ring, and an extravagant feast. With these symbols, the son’s inheritance has been restored. He has been reconciled with his family, and there is much rejoicing in his father’s house. That is why Jesus gave us the Sacrament of Penance and Reconciliation. He wants us to be truly free! He wants to free us from the slavery of sin. He wants us to live a life of abundance—of pure joy! Sin harms our relationship with God. It distances our selves from our Father in heaven. Sin hurts us too. We are all broken and scared by sin. That is why this is one of two Sacraments of healing. 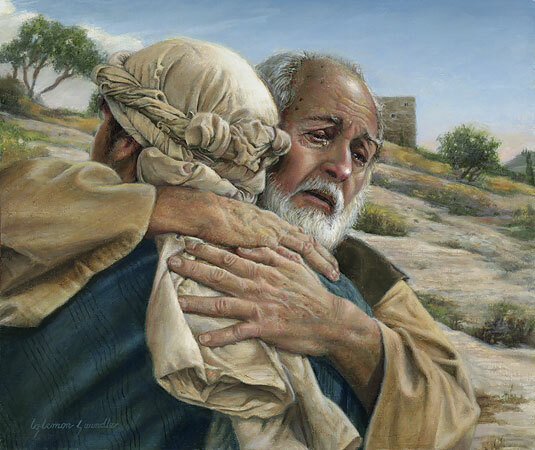 Have you ever noticed that in the Gospels, when Jesus heals someone he almost always forgives their sins. Jesus heals the body as well as the soul. He restores a sick and broken body to wholeness, and he restores a broken spirit to holiness. He restores the ruptured relationship between us and God. When we sin we harm ourselves. In addition, when one member of the body of Christ sins—all Christians are affected. Sickness and death are a reality because sin entered the world. Our first parents chose to let it in. It is not our natural state. God created humans to be body and soul. Our bodies are not just on loan to get around the earth a bit easier. We believe that at the end of the world, our bodies will be resurrected. It is in the Apostle’s Creed: We believe in…the resurrection of the body. Confession and repentance are the remedies for sin. So we have this wonderful Sacrament that Jesus himself gave us, and it is underused. That is a sad reality. But then it is tragic that too often we take all of the Sacraments for granted. Why did I say that it is a tragedy that we under use and under value the Sacraments? Sacraments are real actual encounters with God through Jesus and the actions of the Holy Spirit. We say that they are signs pointing to a reality. They are also called symbols, but not in the secular meaning of symbol. Symbol in theological language means to put together—to unite man and God. So Jesus is truly present in the consecrated bread and wine. The opposite is diabolic which means to pull apart. So Sacraments are not magic spells, or rituals, or nice blessings. They are where we meet God. Really. Heaven and earth touch. God uses material things water, wine, bread, oil to be with us. We are embodied souls. So he touches us in a physical way. The incarnation– God becoming man—true God and true man—to reveal himself to us is at the heart of the Sacramental life of the Church. This is all really nice you might be thinking. But why do we need to confess our sins to a Priest? Well for one thing, Jesus gave the apostles the power to forgive sins. Catholics are required to go to confession for all grave—mortal sins before receiving Eucharist. This is because mortal sin severs our relationship with God. Venial sins hurt our relationship. They cause a gap between God and us. In addition it is one of the precepts of the Church that we must go to Confession once a year for grave sins..
Another important reason is that God calls us to have a real relationship with him through his son Jesus Christ. In our relationship with others, we need to apologize in person with words. It is the same with God. The Priest represents Jesus Christ. We apologize to Jesus when we go to Confession. We are called to live a life of holiness. This means answering the radical demands of the gospel and the Ten Commandments. In order to do this we have to strive to avoid sin. To live a holy life, in other words, does not mean just doing what is socially acceptable. Christians cannot think that if everyone else is doing it that it is okay. Holiness is beyond being good. Christians are called to be on a true quest for holiness. But sin gets in the way. Even saints sinned. The difference is that they lived holy lives. They confessed their sins and turned back to God. This is the way to heaven. Eternity is a long time. We can choose to live it in hell or we can choose a place at the heavenly banquet—the heavenly feast. We can choose an eternity that is miserable, or we can choose one of endless joy. Picture it. God is waiting outside the Confessional. He sees you coming and runs to meet you eager to embrace you and take you back into the family. Are you ready to begin the journey? Link: The Light is On for You from the Archdiocese of Washington (DC). This entry was posted in Sacraments and tagged Confession, Sacrement of Penance and Reconciliation. Bookmark the permalink.